Maggie was a dancer in New York back in the 70’s. She is a natural mime, and is always open to whatever impulses the world sends her way. Walking with her has been an adventure for the last 25 years, since I never know what unexpected, playful gesture or move she’ll make. This day for example; bitterly cold, a mistral blowing, but out we went for a walk up and down the quiet streets of Bonnieux. She is just as likely to jump up on a wall and walk it like a tightrope, as she is to spin around when a gust of wind spirals the leaves across the road and around her feet. She was 15 feet ahead of me when I saw her interacting with the tree, and so lost in play was she that I was able to slide up behind her without her knowing I was there and make a series of images which speak to me of the child still living inside the adult. I am reminded that our loved ones are just as crazy as the rest of the world, and that intimacy is no excuse to not see them as separate and amazing. 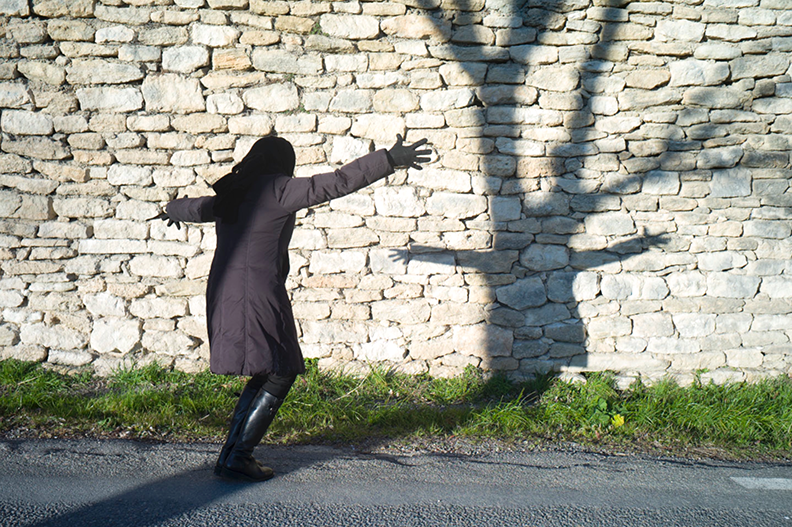 This entry was posted in Mime and tagged Bonnieux, France, Maggie, Mime, Plane tree, Provence, Shadow, stones, Wall on February 2, 2015 by joelmeyerowitz2014.